Rejection. Yes, that bad word. It is part of our vocabulary, and is not a very nice word. For some of us, it has been part of our vocabulary for much too long. Nobody likes rejection. It is, indeed, very painful. Especially if one’s heart is set on something – or someone – rejection can be particularly painful, even crippling. I can personally share, however, that the more rejection one experiences, the easier it is to take. After having experienced much rejection (more than I like to think about) throughout the course of a number of years regarding employment, I stopped actively seeking work and returned to school. When the school goals didn’t materialize as I had hoped, I took some time to reorganize my thoughts and set about continuing to do what I enjoy the most – being a mom, and writing. Having stepped out of my career, it has been all that much more difficult to gain re-entry. And, everyone always has lots of advice, though I believe that I have tried everything that everyone has suggested. If they say it, I’ve done it. The thing is, one can’t just change the way in which people think. They must be open and willing to consider flexibility and creativity in employment scheduling and responsibilities. If employers are unable to do that, they have already rejected potential employees, by default. Thankfully, I have family support and am able to get by. It is very difficult, however, for outspoken women, especially those who are a little older, to get ahead in a society that doesn’t seem to want to hear us, and would often rather put us in our place. Certainly, there are many women who get ahead by just saying “yes,” however I need to be able to sleep at night, and if something is not correct – morally or ethically – then it is not suitable for me. It always amazes me regarding the number of people who can say or do things that I would not consider, and they are totally okay with it. Recently, not looking for employment, I was offered a part-time job in the area of writing education. Admittedly, I was very excited, but didn’t get my hopes up too highly. The per hour wage was certainly very good, however that it would have required several days out of my week to drive quite far from my home put a damper on things very quickly. I probably would have paid just as much to gas up my vehicle as I would have earned in income. While it would have been nice, it would have been nicer if it was closer to home. Further, a contact of mine recently asked for some advice about job-seeking and career transitions. While I provided advice about several different topics, I also know that everyone can always give advice and is full of advice. It is truly what is in one’s heart and within their inner spirit that must guide them and to which they must turn to uplift them. In seeking employment or even voluntary positions, we must be real regarding ourselves, our capabilities, and our financial means. In times such as these, I have found that it is better to expect rejection. One is definitely not nearly as injured in his or her self-confidence if one’s best foot is placed forward, and a rejection is given. But even more than that, in rejection, one is getting a step closer to gaining or acquiring the position that he or she may desire. And, if one experiences many more rejections than he or she would like to contemplate, one must always reflect on what he or she already has. What talents and skills does one already possess? What is one doing in their time to be creative, to network, to be open to opportunities? Sometimes, just being at the right place at the right time is essential. One must recognize that, as well, and be thankful for it. One must also keep in mind that, if one is able, going back to college is a wonderful opportunity to update skills, network, meet new people, expand horizons, and just be in a different environment. Where people are open, flexible, and creative, many opportunities abound at colleges for potential employment, internships, and activities. Perhaps participating in or leading one activity may lead to an opportunity one was not expecting. Or, at other times, one’s talents and skills may not be valued at all, and one must seek other opportunities for development and/or advancement. Luckily, I am not a person who lives for money. My priorities generally reflect more of a “quality of life” perspective, both for myself and my family. I have learned, through the years, that it is not the amount of money one has that makes him or her happy. One’s attitude, perspective, and quality of life that one provides to oneself and one’s family are truly the best. Of course, money is important for survival and we all need a certain amount of it, but it need not be the ultimate end in one’s life. Therefore, rejection – whether in career, employment, relationships, or otherwise – is definitely painful, but one must keep in mind that rejection can be a good thing. Rejection, depending upon one’s view, can be one step closer to achieving one’s goal, to getting what one desires. Or, in situations of much rejection, it is an opportunity for one to recognize and appreciate what he or she already has, and to capitalize on that. Rejection certainly can hurt one’s self-confidence – and coming from the Rejection Queen, herself – I understand it’s stunting qualities. However, one must keep their faith and inner strength alive in believing that rejection is not always the worst thing, and that it may, in fact, open doors to other paths untaken that may be more fruitful or beneficial in the long run. Twenty years ago this month (February 2013), I graduated from the University at Buffalo (UB) in Buffalo, New York, having earned two baccaulaureate degrees in psychology and political science. Unofficially, I also earned a specialization in music performance in voice and clarinet. And, I completed my studies at this very rigorous university in less than 3.5 consecutive years. I completed my studies in December 1992, my degrees were conferred in February 1993, and I participated in the Commencement Ceremony in May 1993. 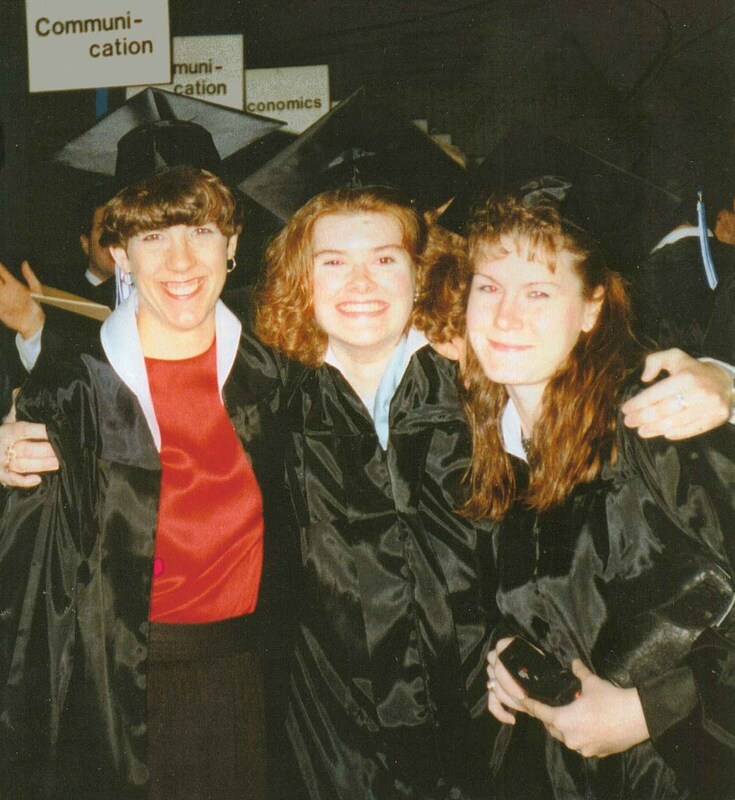 It is so difficult to comprehend that 20 years have already passed since my degrees were conferred! It seems like such a lifetime ago that I had graduated from my high school in Gowanda, New York, and began my adult journey in life at UB. How fitting on this President’s Day, February 18, 2013 – 20 years since I completed my undergraduate studies at UB – that I should recall some of the good memories of my younger and more inexperienced days as a college student there. As a college student at UB, there were so many activities in which I was involved. Always very outgoing, I wanted to be involved in as much as possible, desiring to get the most and best that life had to offer. At UB, the world opened up to me and I took it all in – the good, and the bad, too (when I couldn’t avoid it) – like a sponge. UB was my oyster, and I revelled in all that it had to offer. Indeed, I am proud of all that I accomplished and all in which I participated and/or had leadership opportunities with at UB. With all of my classes, activities, and just living in general, there was not enough time in the day to pack everything in! During my first year, I carried a heavy load of classes, while also performing in the wind ensemble (and being a soloist) and chorus, as well as participating in field events on the women’s track team (and earning a personal best in shot put at the NCAA championships), being involved in student government and yearbook, and going for tutoring on some evenings for my failure in chemistry. I also immersed myself into intermediate Spanish during my first year, and was happy to be exempt from introductory English composition, however I had to take courses to catch up on my math proficiency. As time went on, I also found the Polish, Irish, and German Clubs at UB, and was involved in each one, being both the Treasurer and Homecoming representative of two of the groups. I will always appreciate my Polish Club Homecoming co-rep for showing up and being a gentleman during one particular year because the co-rep from the Irish Club chickened out and forced me to go solo, which I did during another year, however embarassing that was (needless to say, he never showed his face at the Club meetings again after that). Being a member of these ethnic/language-related clubs opened my world yet further to students of Irish descent from New York City, as well as those of Polish and German descent from right around Buffalo. The Irish Club, in particular, was a favorite of mine because I could always “let my hair down” and be myself with my friends in that group. No matter our background or experiences, we always respected and accepted each other, and enjoyed each other’s company. Additionally, it was my membership in the Polish Club that opened up opportunities to visit Poland as an exchange student to Jagiellonian University – and travel to several European countries, which I did during one summer, and had an absolutely fantastic time! It was all just as it was described to me – and so much more. In changing my major from physics to psychology in my second year at UB, I found my life becoming much less stressful. No longer pursuing studies toward my goal of becoming a veterinarian, I found classes in which I truly excelled and enjoyed, those that “fit” my personality. Psychology and the social sciences were right up my alley, and I took opportunities to complete independent research in political science, as well as to be a research assistant in a sensitive graduate-level psychology research project. Also, the more classes that I took in political science, the more I enjoyed them, and became a double major, desiring to go to law school and become an attorney. I, therefore, became a member of the Democrats Club, as well as the Political Science Club, and traveled with several members during one year to visit Yale University, a very impressive campus, indeed. And, in my last semester at UB, I was named to the Dean’s List – miracles never cease! Also during my time at UB, I was involved in other activities such as the Aeronautics Club, Striders Club (and I often went running independently at night under the lights), Recyclers Club (I had responsibility for managing the recycling in my dorm), and I was a regular participant in the religious celebrations of my faith that were held on campus, where I also became a lay Eucharistic Minister. I also remembered the memory of a slain fellow UB student, Linda Yalem, by attending a memorial service for her, and running in the Memorial Run in her name. I also worked part-time on campus, and was involved in so many groups and activities that I have difficulty bringing them all to mind. Further, I took opportunities to attend college sports games, such as volleyball and basketball, even after having attended so many football games as a member of Pep Band. It was in Pep Band that I met some really great, “real” people with whom I became friends, and with whom I kept in touch for a number of years as a student at UB (see photo to follow). Within all of that, I attended many college events that included students, student-athletes, student government representatives, public officials (such as the mayor and governor), and college leaders (such as the president and his family, vice president and his wife, dean of students, and others). Not only did I know many students, professors, religious leaders, and coaches, but I also met and got to know a few of the college leaders who so often worked behind the scenes to improve the university and try to make it better for everyone. Of course, there were situations in which they did not always make things better, but I believe that the majority of them tried to the best of their ability to achieve that endeavor. Particularly in my last year at UB, I got to know UB’s President Bill Greiner (sadly, who is now deceased) and his wife, Carol. It often seemed that no matter where I was or what event I was attending, they were there, too! It was great to see Bill and Carol so “involved” in student life at UB. It was wonderful to observe and experience their commitment – not only to each other as great role models – but also their commitment and dedication to the students, faculty, staff, alumni, and patrons at UB. I always made a special effort to speak with Carol as she is so intelligent, insightful, and positive, always having something kind and encouraging to share. I definitely aspired to be more like her as she is such a great female role model and inspiration. 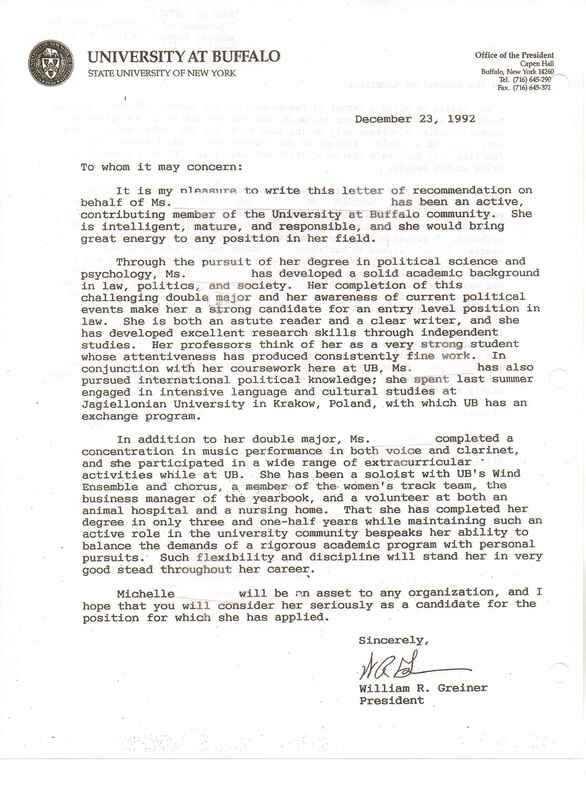 Before leaving UB upon completing my studies in December 1992 to head to New York City for about one year, I asked President Greiner to write a recommendation on my behalf. Being so proud of myself and all that I accomplished at UB, as well as having some bittersweet memories and having experienced a critically life-changing event in my last semester as a student at UB (and surviving through it in the years to come), I desired something more to take away with me from my UB experience – just some pieces of paper with words written on them about me by others familiar with me. My recommendation from President Greiner is the very first formal, written recommendation that I ever received (see document above). He very eloquently and concisely stated many kind things about me, which I fondly remember and review to this day. His recommendation is also one that I sent, along with my resume, in my job search to about 100 law firms in Buffalo in 1993-1994. The piece of paper that I received from him was one that certainly helped to open a few doors for me, and I will always appreciate that, even though I did not pursue a law degree. In fact, I can look back on it now, and remember a conversation that Bill and I shared one day, during which he inquired about the career I intended to pursue. When I told him that I was interested in being a lawyer, he actually discouraged me from pursuing a law degree, stating that law firms are like factories. I believe and warmly recall that he already knew that such a profession would not fit my personality. There is definitely alot that I miss about UB, and I have fond memories and tearful nostalgia about many of my experiences at and through UB. UB was a place in which I became an adult, whether I like it or wanted to, or not. I can remember so many wonderful things about my experience at UB, however one or two critically hurtful things have also colored and clouded my perspective, still, to this day. However much I would like to remember only the good things, the harmful experiences are also a part of who I am, of who I have become, for whom I advocate, and for whom I support – women (and children) who are victims and survivors of violent crime, trauma survivors. While I believe that there are reasons for everything, I must be real in remembering my experiences at UB, both good and painful. While there are many more good things that I experienced as a student at UB, what I experienced that was harmful – I believe – has shaped me into becoming a better, and more insightful, compassionate, sensitive, and understanding individual. My experience at UB has helped me to become an advocate for and supporter of victims. And, however painful, I have my experience at UB to recognize for that, too. I also have that experience in being aware that not all offenders of violent crimes are apprehended, charged, or prosecuted, as well. Further, such experience taught me that survivors of violent crimes may be revictimized by police and prosecutors. I would not be who I am today without recognizing and being aware of all of my experiences, and I am now thankful (in a very sad way) for having such an experience because it has helped me to relate more personally with other victims and survivors of similar experiences, including those who are close to me. While we cannot remove from our consciousness those painful experiences, we can try our best to make them better for ourselves and others. I, therefore, remember that when I left UB, I intended to change the world, however it has been the world that has changed me. 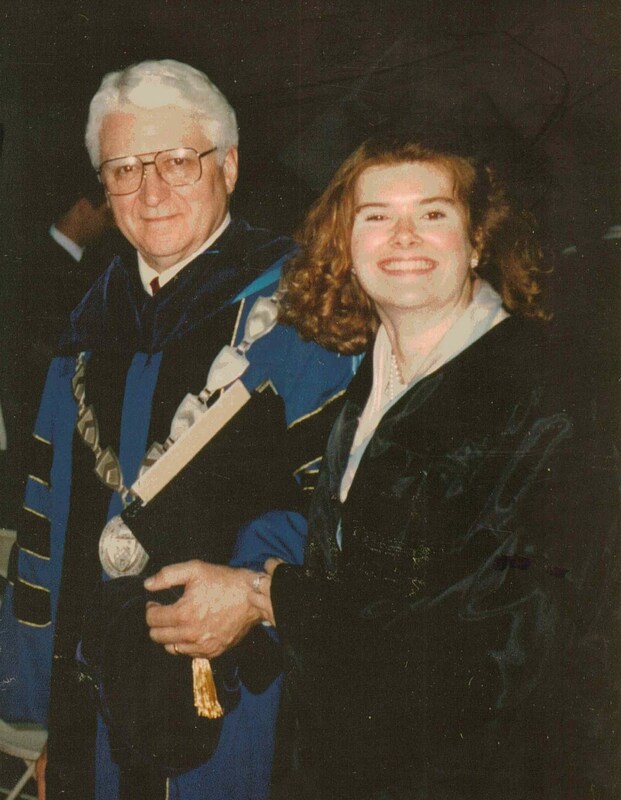 So, on this President’s Day 2013 – and 20 years to the month that my baccaulaureate degrees were conferred to me – I remember and recall many of my experiences as a college student at the State University of New York at Buffalo (UB). I had many wonderful experiences there, met many wonderful people there, and have many fond memories of my time there. However much I would prefer not to remember the painful experiences that I had there, I would deny myself and not be who I am today. And so, I must also be strong in mind, body, and spirit and integrate all of my UB experiences into my life, God willing. Hopefully in doing so, I will have also assisted and supported others who have had similar good and/or painful experiences in their lives. Therefore, I must recognize UB, for giving me the wings to soar into my life – in all experiences. DellaContrada, J. (2009). William R. Greiner Dies. Buffalo, NY: UB – University at Buffalo: News Releases. State University of New York at Buffalo Graduation, May 1993. Buffalo, NY. This article was also published by both the University at Buffalo Alumni and RAINN on LinkedIn (February 2013). Mountain View, CA: LinkedIn. In 2010-2011, I returned to school at my local Gwinnett Technical College (GTC) on Georgia’s Hope Grant, pursuing studies that certified me in healthcare. In transferring courses from my undergraduate university, as well as completing required prerequisite courses to pursue further program studies in healthcare-related fields, I successfully completed all courses and requirements, maintaining a 4.0 grade point average, being named to the dean’s list on two occasions, being named to the college’s honor society – as well as being an active participant in it – and earning a percentile score of 97% on the HOBET, a healthcare admissions examination. In two of my courses completed at GTC, I also earned the highest possible ethics score of 3/3 for my performance, a score that is rarely issued to students unless exceptional ethics and mastery is reflected. Having been unable to re-enter into the teaching field for two years – at that time in 2010 – I chose to pursue a career change. It was my desire to pursue my interest in healthcare, and to enter into a nursing or other healthcare-related field. Reflecting my interests, schedule availability, and financial need, I applied – twice – to GTC’s program in medical assisting, and was twice rejected from it. Being eligible for the Federal Workforce Investment Act Grant in Gwinnett County, since I had been laid off from my previous employment, I met all the criteria for receiving the Grant due to employment as well as financial circumstances. Unfortunately, I also discovered that the Grant was not transferrable to other counties and was required to be used – if issued – in Gwinnett County, since that was the location of the employer that had laid me off one year prior to that. Devastated that I had been rejected from my desired program of study on the first occasion, I went through the appropriate channels of college administration and made a formal complaint. In part, I expressed how the majority of the individuals who met with me in the formal interview process were nearly 30 minutes late to the arranged interview time, that there was no apology provided for their lateness, that the program director basically told me that I was overqualified and wondered why I was pursuing a program in which the income was low, and that the interviewers’ questions were extremely negatively-focused. I also informed college administrators (the president and two vice presidents) that I was told by one interviewer that I would fail (!) the program. I stated in my complaint that it was obvious to me that the decision had been made to reject me from the program long before the formal interview, and that the interview only sealed the fate they already had planned for me. When – as I expected – the president finally responded in writing (see letter to follow) to my complaint and appeal, she upheld the decision of the interview panel to reject me, as well as the decision of one of her vice presidents in refusing to reconsider my application to the program for that semester. I then met with the vice president who refused to reconsider me, and discovered, in part, that the program director told her that she believed that I would be unable to complete the program due to my financial status. What?! The Workforce Investment Act Grant would have paid for my studies, and with my 4.0 GPA and outstanding ethics, I would have likely had nothing but success in the program, once accepted. The vice president was further concerned that I had written to certain state government officials, particularly the state labor department commissioner, about the rejection that I had experienced, stating that the manner in which I was rejected was unprofessional. Was it not unprofessional? 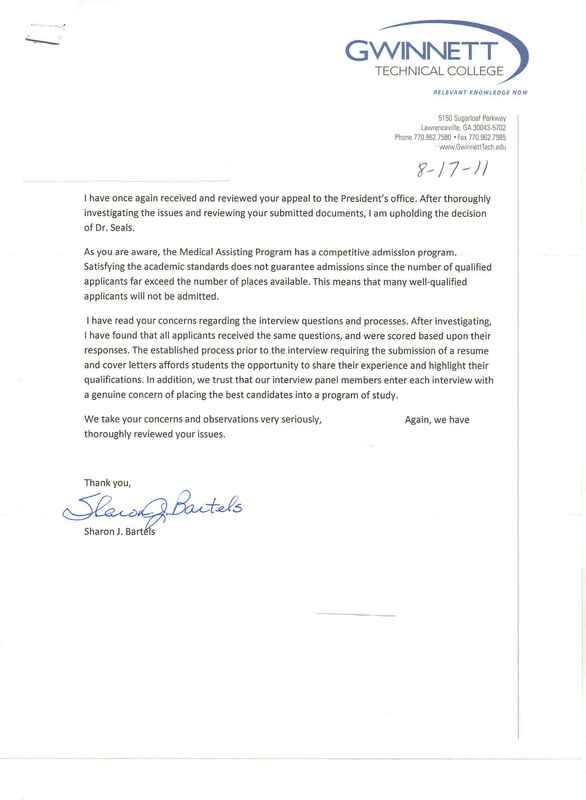 I, therefore, wrote additional appeals for consideration for entry into the medical assisting program at GTC – and explained all of the circumstances surrounding my desire to pursue the program and being rejected from it – to a number of state and federal government officials, some of whom included the governor and his wife, a Congress member and his assistant, the technical college commissioner and his assistant, and higher ranking members of our national government, including the President, First Lady, Vice President, and Secretary of State. 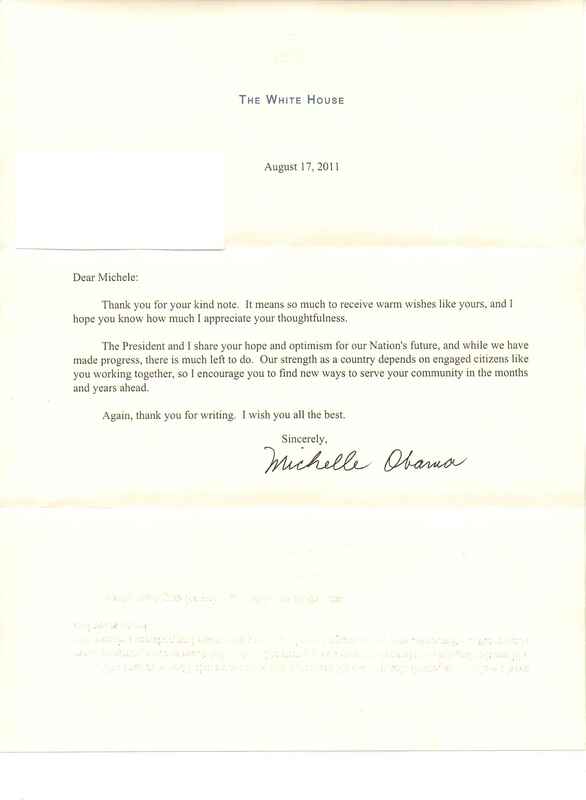 I received kind responses from the Governor (see letter to follow), the Congress Member’s assistant, an assistant to the US President, and the US First Lady, Michelle Obama. 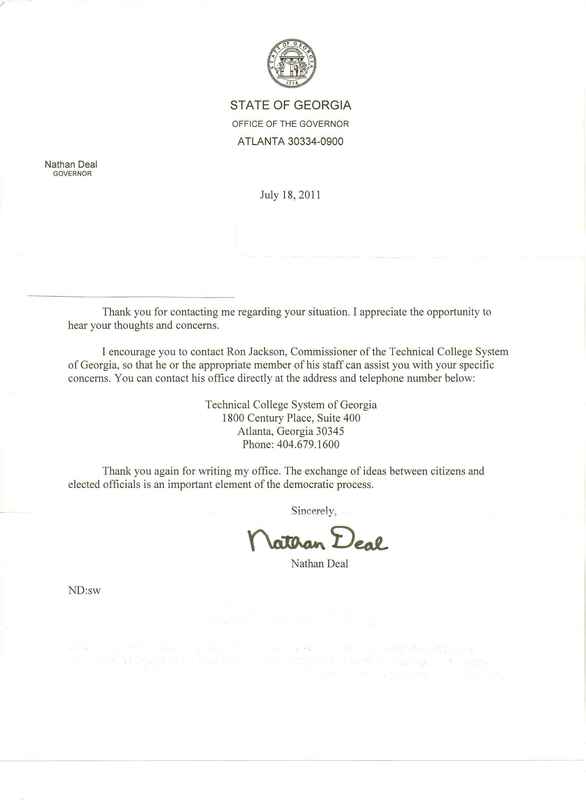 The technical college commissioner’s assistant also heard me out on a couple of occasions, though nothing was done to overturn the decision that was already made to reject me, nor to reconsider me in any way at that time. The response that included much common sense and understanding about my personal situation was that which I received from First Lady Michelle Obama. She, in part, suggested to me that I do something else to benefit my community (see letter below). A number of efforts were made by staff at GTC to usher me into different healthcare-related programs, and/or to encourage me to consider other options, including applying for several positions as an instructor at the college. My heart, however, was set on pursuing the medical assisting program, and so, less than one year later, I applied to the program for a second time. On the second occasion in which I interviewed for the medical assisting program, a brand new program director had been hired and who was present in the interview, as well as an entirely different interview team. Though I thought the interview to have proceeded professionally and well, and believed that I had a wonderful chance at acceptance – even though my second application to the program was overlooked in Admissions and I had to follow-up on it several times in order for it to be recognized – I was rejected again, for the second time. Devastated again, for the second time, I decided that enough was enough. After spending three years in trying to pursue medical assistant studies at GTC and being rejected twice – after also being an honor graduate there – it was time to walk away. I could see that there was no convincing the folks there of my interest, desire, and need to pursue this career. They had not provided me with an opportunity to succeed, but only to fail, and it was imperative that I find success elsewhere. Perhaps they felt threatened by my education, perhaps they did not believe in me, perhaps they just didn’t like me. After all, the new program director was less educated than I am. Whatever the reason(s), I don’t know, and it doesn’t matter anymore. Following this second rejection, I did not write any letters. I did not make any formal complaints. I did not call any government officials. Instead, I was just heartbroken and I cried. It was just too sad and too much for me to bear. I discovered that it was actually true that so many people did not want me to succeed. Even one of the professors about whom I had written a compliment letter to admininstrators, and who was an interview panel member in my second interview, rejected me. So many people withheld an opportunity for me to be successful, to pursue an interesting career, to be able to care for myself and my family in a manner that would have provided increased financial security. I resolved that it was their problem and their loss. It would have been easy to give up following these rejections. It has been these rejections added to so many other rejections. It is easy for people to say to try again, to keep trying, not to give up. However, one cannot get ahead when one continually runs into a brick wall. A single, divorced mother without employment and who is highly-educated cannot give up. No matter how much I am down, I always, always find a way back up. I have strength. I have faith. And, I know that God is always there for me, no matter how difficult and impossible the circumstances. I know that life may often seem unfair. Needless to say, I have not applied to GTC’s medical assisting program for a third time. No, I’m not going to do that. Why waste any more of my time, effort, hope, emotion, and money? I’ve already walked away. My hurt has healed. I realize that the door was closed to me long before I even went to my first interview for consideration into the program. I need something that can deliver. I do not desire to be in a place where I am not valued or understood, so I am now thankful for being rejected from a place in which so many did not value or understand me, my interests, or my needs. So, I look back on all of this, now, and believe that – as I always do – everything happens for a reason. When one door shuts, another is opened. I have faith, and I have hope. And only time will tell. Yes, here it is, folks! It’s the road that you’ve been waiting for! And my, it is quite a beautiful road, I must say. 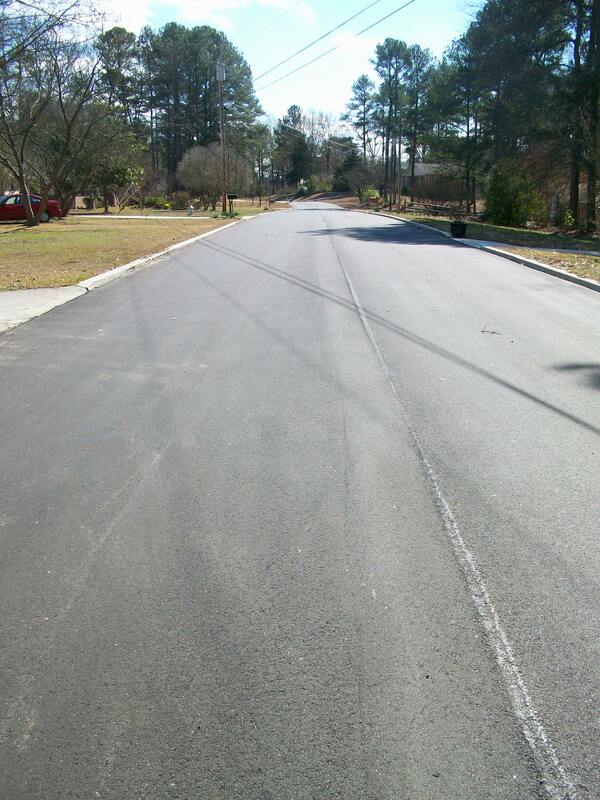 Seriously, several streets in my neighborhood have been newly paved, and they are beautiful! I guess this is what you would call ‘resurfacing,’ to someone who doesn’t know alot about the appropriate terms to use when describing road paving. It is all really nice. About three weeks ago, the workers, trucks, machines, and equipment were in full gear in my neighborhood, paving two streets and a large portion of one lengthy road. The workers moved along quickly and appeared to take pride and were professional in their project. On one particular day, I stopped in my vehicle and spoke to two workers, complimenting their handiwork, and one replied, “The pleasure is ours, Ma’am.” Not only did the E.R. Snell Contractor Inc. employees of Snellville, Georgia do fine, professional work, but they were also courteous and pleasant, as well. So, my thanks goes to E.R. Snell Contactor Inc. and their professional and courteous employees for resurfacing several of the streets in my neighborhood. 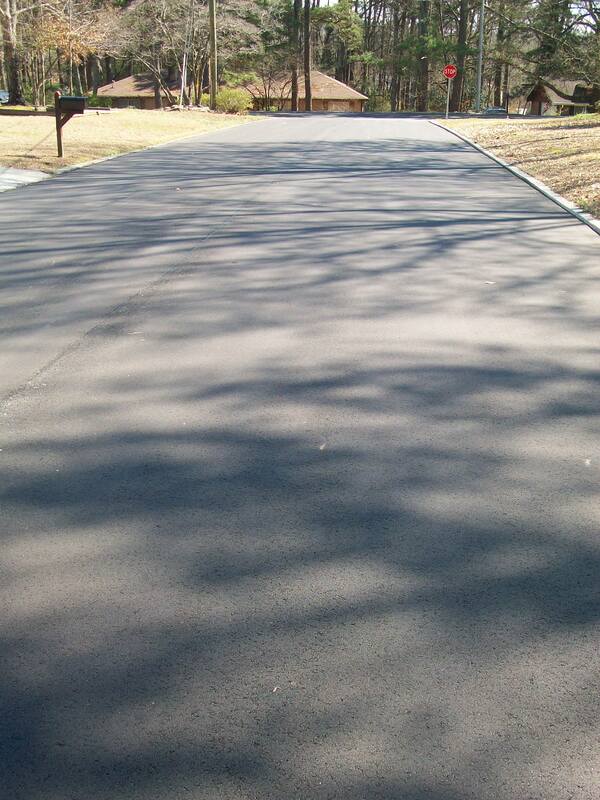 They are really beautiful, and the work appears to be of high quality so that the roads will last a good long while. I have been wanting to make this post ever since the roads were re-paved, though I must apologize since my son was ill for several days, and I have been ill, and we have also had some other issues going on. So, please don’t think all of this wonderful work has gone unnoticed – it certainly hasn’t! 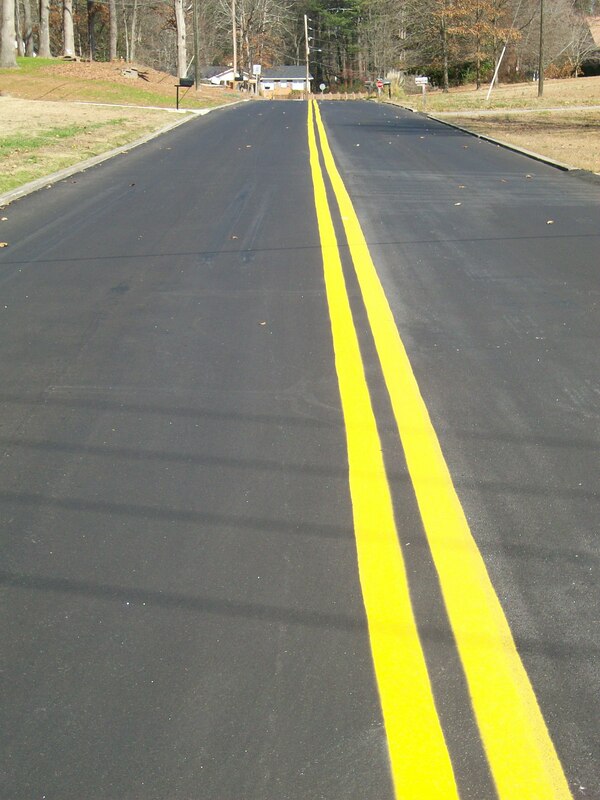 It’s not every day that the roads in one’s immediate area are resurfaced; and I, for one, certainly appreciate it. Fidelity and morality. They are two different words, yet they are intertwined, especially in association with relationships, partnerships, and marriages. Fidelity refers to “faithfulness,” while morality can be understood as meaning the difference between right and wrong, or a reference to one’s personal values. In a marriage, fidelity means being true to one’s spouse or partner, while morality can be described as acting in accordance to one’s values of right and wrong within that marriage. In my 41 years, including those 9 years within which I was committed to a serious relationship that resulted in marriage (and, unfortunately, later divorce), I will admit that there were a few occasions during which I was tempted to stray from my vows, to go back on my holy and blessed commitment to my spouse. I am proud to say that while I never strayed or broke my fidelity, physically or sexually, I am guilty of becoming too emotionally involved on a couple of occasions. When spouses stop communicating effectively, cease to love each other, and no longer care about each other in many different ways – by words, body language, actions, degradations said in the presence of others – it is all too easy to look elsewhere for one’s needs and desires to be fulfilled. When spouses and/or partners in any relationship do not understand, appreciate, love, or respect each other, their bond is deteriorating. Sometimes, one spouse tries very intently to maintain and strengthen the relationship bond, while the other is oblivious and uncaring about the problem. At other times, both spouses may work at it and improve their relationship. And, in other instances, both spouses may give up hope and throw in the towel because too much hurt and pain has already caused too great of a rift or distance between them that is irreparable. Recently, a man whom I have known on a completely platonic level, asked me out to coffee. He is someone whom I have known in my religious community for the past 2.5 years, and we both share the same religious faith. He and I have always been friendly to each other, and have seemed to appreciate and respect one another, period. He is intelligent, attractive, … and married with two young children. Therefore, certainly “going out for coffee” in his mind is not merely and innocently going out for coffee. Certainly, for a woman in my position of being divorced and single with a child of my own, I admit that I am want for a meaningful, personal, intimate relationship. I would like to share meaningful events and experiences in my life with a spouse who thinks and feels similarly to the ways in which I do. It would be nice to share spiritual, emotional, personal, physical, sexual, and even financial situations with a close and caring spouse. It would also be wonderful to have a man in my life who would be a caring role model for my son. So, while it is a temptation to become involved with this attractive, intelligent, spiritual man who is also my peer, I declined his invitation for coffee. In my refusal, I also stated to him that I do appreciate his friendship. However, he must understand that the platonic friendship is as far as it goes. I am not one to sneak around and be dishonest. I am not about to lie and go against my morals, values, and principles. I try my best to be out in the open with everything, unless it is something that is seriously going to hurt or damage myself or my family in some way. It took 2.5 years of this man’s friendly relationship with me for him to ask me out for coffee. Even when I declined, he still held out hope that I might someday change my mind, as that is what he shared with me. I pray for him that God will help him see that he has a good, committed wife and two wonderful, beautiful children. While he may wish to fulfill his own unmet fantasies and desires, he does not realize what an affair would do to his own family or mine. I already know all too well that many men will say whatever they like just to convince a woman to go to bed with her. Those men promise all kinds of things, and then, never deliver. They want all the fun and pleasures, but not the true commitment. I am not interested in that, and am not about to get involved in something that will hurt so many people, not to mention go against my morals and values. When a person is married or in a committed relationship, fidelity is precious. The fidelity that has been bestowed upon the couple has been done so in a holy and/or legal manner. When we are not happy or things aren’t going well, it is all too easy to give up and throw in the towel. I have even told my ex-husband that my own parents experienced worse trials and tribulations that we ever did, and they will celebrate 50 years of marriage this year! So, men and women out there, perhaps you don’t love your spouse in the same manner as you used to, but remain open-minded and do not become blinded by your unfulfilled or unmet fantasies and desires of flesh that are fleeting and temporary. Look at and stick to your commitment – strengthen it, make it better…for yourselves and your children. Gail, Thank you for keeping us current on what is happening regarding mobbing and bullying. I agree that people often do not consider, realize, or care about the moral injury that they are creating against others with their words and/or actions. Ours is a society that is focused on people’s personal self-interests, and people always believing they are right and correct. Few people are willing to place themselves in another’s shoes, and have concern and compassion, as I was taught. And, too many workplace and/or organizational leaders are the bullies – they create an atmosphere that is conducive to their own bullying of others. All too often – because there are no laws against it in our country as there are around Europe – the bullying continues in a vicious cycle. In fact, I often find that it is the bullies who may get more promotions or more perks or more rewards…because they put on a great face, know how to be dishonest, and typically blame others rather than themselves. This is how our society has become all too much. Thanks, again, for sharing your article and perspectives! * Bullying Column from the Workplace Violence Prevention E-Report December 2012 issue. A recent study showed that about 35 percent of students who are bullied experience post traumatic stress disorder (PTSD) symptoms. This study echoes the findings of workplace mobbing research done by Dr. Heinz Leymann in the early 1980’s and has been validated many times by targeted individuals with whom I have worked. If we understand that bullying and mobbing attack the spiritual, psychological and emotional health of the individual as well as the physical, we also must consider that the damage done in an organization by this behavior goes beyond those directly involved.